Olivia has a problem. Locked inside a closet fifteen minutes before her wedding, she is desperately trying to escape. But as the congregation gather outside, can Olivia piece together the events of the past few days? Is her boss a white slaver? Is her vicar an occultist. What part does her boyfriend Steve play in it all? 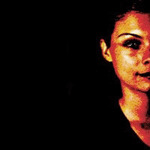 Performed by MyAnna Buring (Sexiest Woman of the Fringe 2003), Monologue for an Ensemble is a surreal and poignant comedy. "MyAnna Buring is at the top end... Go and see the show... This is a one woman show I would definitely recommend."